A fantastic price comfortable beds and proximity to lots of fishing boating and other water sports are a winning combination for our guests at the La Quinta Inn Jackson North. Set on two floors this motel's 144 spacious rooms feature TVs with premium cable channels. Wi-Fi is available. An outdoor heated swimming pool is a welcome diversion for families and business travelers at the end of a long day and a well-equipped fitness center will keep you toned while you're away from home. The hotel offers a free expanded continental breakfast each morning featuring waffles bagels pastries hot and cold cereals and fresh fruit along with all the hot coffee tea and juice you could want. Parking is free and the hotel is pet-friendly so there's no need to leave your best friend behind. 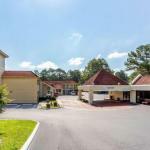 La Quinta Inn Jackson North enjoys easy access to I-55 North. The central parking area of the sprawling Ross Barnett Reservoir â?? the go-to spot for weekend recreation in the area with marinas fishing boating baseball and soccer fields hiking and biking trails â?? is 12 miles from the hotel. Downtown Jackson the Mississippi State Capitol Building the Old Capitol Museum and the Mississippi Coliseum and State Fairgrounds are seven miles from the hotel. Jackson- Evers International Airport is 11 miles away.